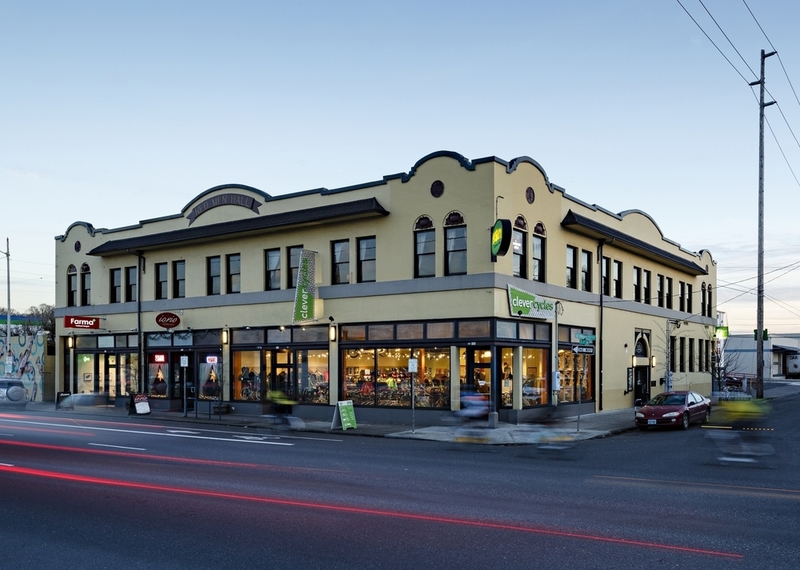 When we found this building at SE 9th and Hawthorne it was a warehouse which had only one door at street level and two unused ballrooms on the 2nd floor. Portland's Zoning for the location required that the structure house an industrial use, such as a machine shop, but we knew the building deserved more. After extensive research of the historical occupants from the last 80 years we approached the City and were approved for a "grandfathered use" of the much coveted Retail designation. Free to perform a complete gut remodel of the entire building, we uncovered treasures such as boarded-over transom windows and remnants of multiple street level recessed entries. We designed a plan to restore the elements which had been demolished in the 1960's and reintroduced a corner entry as well as the multiple retail entries that once graced this building. The building now is home to a vibrant community with shops, restaurants and a comedy club bringing night life back to the ballrooms.